"A Great Time Travel Debut"
Robin wakes to find herself in a strange place, is it a hospital, or a prison even? After falling asleep she wakes back in her own bed and after a few more such dreams she slowly realises her strange dreams are actually time travel, asleep in one time she is awake in another! Once back in her own house in the past she begins a series of adventures, centred around a love affair, that will also change the future. DREAM OF TIME by Nancy J. Price is a good first novel, a mixture of love story and adventure story. The descriptions of the past, San Francisco of 1900, are good. One of the first things our heroine learns is that the past is not a all roses! It is cold, smells bad and clothes take forever to put on. She also has to adjust to the social norms of the era, so different from our own. People are both nosier and also more friendly and helpful. The conventions around dating etc. are I believe very understated in the book, that era would have been much more straight-laced than it is shown as. The characterization is a little lacking but all in all a good first effort which leaves you turning pages to find how it all goes. Each night, when Robin drifts off to sleep, she finds herself dreaming about the life of a woman in the Victorian age. She soon realizes it�s not a dream at all, but she is truly slipping into San Francisco�s past. 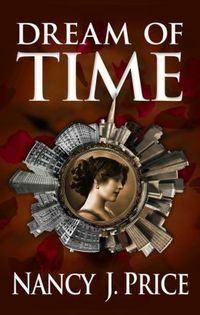 While living two lives � one as a mom in the modern day, the other as a proper young lady at the turn of the century � she discovers how she�s being sent back to a bygone era is only the first mystery. A much more important question is why she�s there.